For the larger local government district, see City of Wakefield. For other uses, see Wakefield (disambiguation). Wakefield is a cathedral city in West Yorkshire, England, on the River Calder and the eastern edge of the Pennines, which had a population of 99,251 at the 2011 census. The Battle of Wakefield took place in the Wars of the Roses and it was a Royalist stronghold in the Civil War. Wakefield became an important market town and centre for wool, exploiting its position on the navigable River Calder to become an inland port. In the 18th century, Wakefield traded in corn, coal mining and textiles and in 1888 its parish church acquired cathedral status. It became the county town of the West Riding of Yorkshire and was the seat of the West Riding County Council from 1889 until 1974, when the county and council were abolished, and of the West Yorkshire Metropolitan County Council from 1974 until its dissolution in 1986. The name "Wakefield" may derive from "Waca's field" – the open land belonging to someone named "Waca" or could have evolved from the Old English word wacu, meaning "a watch or wake", and feld, an open field in which a wake or festival was held. In the Domesday Book of 1086, it was written Wachefeld and also as Wachefelt. Flint and stone tools and later bronze and iron implements have been found at Lee Moor and Lupset in the Wakefield area showing evidence of human activity since prehistoric times. This part of Yorkshire was home to the Brigantes until the Roman occupation in AD 43. A Roman road from Pontefract passing Streethouse, Heath Common, Ossett Street Side, through Kirklees and on to Manchester crossed the River Calder by a ford at Wakefield near the site of Wakefield Bridge. Wakefield was probably settled by the Angles in the 5th or 6th century and after AD 876 the area was controlled by the Vikings who founded twelve hamlets or thorpes around Wakefield. [nb 1] They divided the area into wapentakes and Wakefield was part of the Wapentake of Agbrigg. The settlement grew near a crossing place on the River Calder around three roads, Westgate, Northgate and Kirkgate. The "gate" suffix derives from Old Norse gata meaning road and kirk, from kirkja indicates there was a church. Before 1066 the manor of Wakefield belonged to Edward the Confessor and it passed to William the Conqueror after the Battle of Hastings. After the Conquest Wakefield was a victim of the Harrying of the North in 1069 when William the Conqueror took revenge on the local population for resistance to Norman rule. The settlement was recorded as Wachfeld in the Domesday Book of 1086, and covered a much greater area than present day Wakefield, much of which was described as "waste". The manor was granted by the crown to William de Warenne, 1st Earl of Surrey whose descendants, the Earls Warenne, inherited it after his death in 1088. The construction of Sandal Castle began early in the 12th century. A second castle was built at Lawe Hill on the north side of the Calder but was abandoned. Wakefield and its environs formed the caput of an extensive baronial holding by the Warennes that extended to Cheshire and Lancashire. The Warennes, and their feudal sublords, held the area until the 14th century, when it passed to their heirs. Norman tenants holding land in the region included the Lyvet family at Lupset. The Domesday Book recorded two churches, one in Wakefield and one in Sandal Magna. The Saxon church in Wakefield was rebuilt in about 1100 in stone in the Norman style and was continually enlarged until 1315 when the central tower collapsed. By 1420 the church was again rebuilt and was extended between 1458 and 1475. In 1203 William de Warenne, 5th Earl of Surrey received a grant for a market in the town. In 1204 King John granted the rights for a fair at the feast of All Saints, 1 November, and in 1258 Henry III granted the right for fair on the feast of Saint John the Baptist, 24 June. The market was close to the Bull Ring and the church. The townsfolk of Wakefield amused themselves in games and sports earning the title "Merrie Wakefield", the chief sport in the 14th century was archery and the butts in Wakefield were at the Ings, near the river. During the Wars of the Roses, Richard Plantagenet, Duke of York was killed on 30 December 1460 in the Battle of Wakefield near Sandal Castle. As preparation for the impending invasion by the Spanish Armada in April 1558, 400 men from the wapentake of Morley and Agbrigg were summoned to Bruntcliffe near Morley with their weapons. Men from Kirkgate, Westgate, Northgate and Sandal were amongst them and all returned by August. At the time of the Civil War, Wakefield was a Royalist stronghold. An attack led by Sir Thomas Fairfax on 20 May 1643 captured the town for the Parliamentarians. Over 1500 troops were taken prisoner along with the Royalist commander, Lieutenant-General Goring. In medieval times Wakefield became an inland port on the Calder and centre for the woollen and tanning trades. In 1699 an Act of Parliament was passed creating the Aire and Calder Navigation which provided the town with access to the North Sea. The first Registry of Deeds in the country opened in 1704 and in 1765 Wakefield's cattle market was established and became the one of largest in the north of England. The town was a centre for cloth dealing, with its own piece hall, the Tammy Hall, built in 1766. In the late 1700s Georgian town houses and St John's Church were built to the north of the town centre. At the start of 19th century Wakefield was a wealthy market town and inland port trading in wool and grain. The Aire and Calder and Calder and Hebble Navigations and the Barnsley Canal were instrumental in the development of Wakefield as an important market for grain and more was sold here than at any other market in the north. Large warehouses were built on the river banks to store grain from Norfolk, Cambridgeshire and Lincolnshire to supply the fast-growing population in the West Riding of Yorkshire. Great quantities of barley were grown in the neighbourhood and in 1885 more malt was made in Wakefield "than in any district of equal extent in the kingdom". The market developed in the streets around the Bull Ring, and the cattle market between George Street and Ings Road grew to be one of the biggest in the country. Road transport using turnpiked roads was important. Regular mail coaches departed to Leeds, London, Manchester, York and Sheffield and the 'Strafford Arms' was an important coaching inn. The railways arrived in Wakefield in 1840 when Kirkgate station was built on the Manchester and Leeds Railway. When cloth dealing declined, wool spinning mills using steam power were built by the river. There was a glass works in Calder Vale Road, several breweries including Melbourne's and Beverley's Eagle Breweries, engineering works with strong links to the mining industry, soapworks and brickyards in Eastmoor, giving the town a diverse economy. Boats and sloops were built at yards on the Calder. On the outskirts of the town, coal had been dug since the 15th century and 300 men were employed in the town's coal pits in 1831. During the 19th century more mines were sunk so that there were 46 small mines in Wakefield and the surrounding area by 1869. The National Coal Board eventually became Wakefield's largest employer with Manor Colliery on Cross Lane and Park Hill colliery at Eastmoor surviving until 1982. During the 19th century Wakefield became the administrative centre for the West Riding, when many familiar buildings were constructed. The first civic building in Wood Street, the court house, was built in 1810. The West Riding Pauper Lunatic Asylum was built at Stanley Royd, just outside the town on Aberford Road in 1816. During the 19th century, the Wakefield Asylum played a central role in the development of British psychiatry, with Henry Maudsley and James Crichton-Browne amongst its medical staff. Most of it is now demolished. The old House of Correction of 1595 was rebuilt as Wakefield Prison in 1847. Wakefield Union workhouse was built on Park Lodge Lane, Eastmoor in 1853 and Clayton Hospital was built in 1854 after a donation from Alderman Thomas Clayton. The Mechanics Institute containing an Assembly Room, public library and newsroom supported by subscription was built in Wood Street in 1820-1821 in the Classical style with Ionic details. Wakefield Literary Society ran there from 1827 until the 20th century and its Geological Society left artefacts to Wakefield Museum. Up to 1837 Wakefield relied on wells and springs for its water supply; water from the River Calder was polluted, and various water supply schemes were unsuccessful until reservoirs on the Rishworth Moors and a service reservoir at Ardsley were built providing clean water from 1888. By 1885 the streets of the town were paved and flagged and lit with gas supplied by a company incorporated in 1822. Between 1870-1885 improvements were made on the north side of town around St John's Church now a conservation area. On 2 June 1906, Andrew Carnegie opened a new Wakefield Library on Drury Lane which had been built with a grant of £8,000 from the Carnegie Trust. There are seven ex-council estates in Wakefield which the council started to build after the First World War, the oldest is Portobello, the largest is Lupset and the rest are Flanshaw, Plumpton, Peacock, Eastmoor and Kettlethorpe. Homes not bought by occupants under the Right to Buy scheme were transferred to a registered social landlord, Wakefield and District Housing (WDH) in 2005. The outlying villages of Sandal Magna, Belle Vue and Agbrigg have become suburbs of Wakefield. The glass and textile industries closed in the 1970s and 1980s, and coal faced competition from alternative sources and demand decreased. The coal mines around Wakefield were amongst the first in Yorkshire to close under the government of Margaret Thatcher, which altered the national energy policy from a reliance on British coal and opposed the political power of the NUM. Between 1979 and 1983, the pits at Lofthouse, Manor, Newmarket, Newmillerdam, Parkhill and Walton all closed. As the Wakefield pits closed, the Selby Coalfield was being opened, many colliers in Wakefield accepted offers to transfer to the new pits which were built to facilitate commuting. Wakefield was anciently a market and parish town in the Agbrigg division of the wapentake of Agbrigg and Morley in the West Riding of Yorkshire. It became a parliamentary borough with one Member of Parliament after the Reform Act 1832. In 1836 the Wakefield Poor Law Union was formed following the Poor Law Amendment Act 1834 with an elected Board of Guardians. The town was incorporated as a municipal borough with elected councillors in 1848 under the Municipal Corporations Act 1835. Wakefield was the de facto seat of regional government in Yorkshire for two centuries and became the county headquarters of the West Riding County Council created by the Local Government Act of 1888. After Wakefield was elevated to diocese in 1888, Wakefield Council sought city status which was granted the same year. Wakefield became a county borough in 1913. In 1974, under the terms of the Local Government Act 1972, the county borough became defunct as it merged with surrounding local authorities to become the City of Wakefield district. Today the city is the headquarters of Wakefield Metropolitan District Council, Yorkshire Ambulance Service and West Yorkshire Police. Since 1987, the district council has been based in County Hall. Wakefield is covered by four electoral wards (Wakefield East, Wakefield North, Wakefield South and Wakefield West) of the Wakefield Metropolitan District Council. Each ward elects three councillors to the 63-member metropolitan district council, Wakefield's local authority. In 2015 all the councillors elected for Wakefield East, North and West were members of the Labour Party and the councillors for Wakefield South represent the Conservative Party. Wakefield's MP is Mary Creagh who has represented the parliamentary seat for the Labour Party since the 2005 General Election. She was re-elected in 2010 with a reduced majority and returned with a 40.3 share of the vote in 2015. The seat has been held by the Labour Party since 1932. The Wakefield South ward covering Sandal, Kettlethorpe, Agbrigg and Belle Vue, is in the Hemsworth constituency, represented by the Labour party's Jon Trickett since 1996. He was re-elected in May 2010 and returned in 2015 with 51.3% of the vote. The seat has been held by the Labour Party since its creation in 1918. Wakefield is 9 miles (14 km) south-east of Leeds and 28 miles (45 km) southwest of York on the eastern edge of the Pennines in the lower Calder Valley. The city centre is sited on a low hill on the north bank of the Calder close to a crossing place where it is spanned by a 14th-century, nine-arched, stone bridge and a reinforced concrete bridge built in 1929–1930. It is at the junction of major north-south routes to Sheffield, Leeds and Doncaster and west-east routes to Huddersfield, Dewsbury and Pontefract. Wakefield is within the area of the Nottinghamshire, Derbyshire & Yorkshire coalfield and lies on the middle coal measures and sandstones laid down in the Carboniferous period. Wakefield includes the former outlying villages of Alverthorpe, Thornes, Sandal Magna, Agbrigg, Lupset, Kettlethorpe and Flanshaw. In the 2011 Census, Newton Hill, Outwood, Stanley and Wrenthorpe were counted as parts of Wakefield, having been classified separately in the 2001 Census. In 2001 the Wakefield urban area had a population of 76,886 comprising 37,477 males and 39,409 females. Also at the time of the 2001 UK census, the City of Wakefield had a total population of 315,172 of whom 161,962 were female and 153,210 were male. Of the 132,212 households in Wakefield, 39.56% were married couples living together, 28.32% were one-person households, 9.38% were co-habiting couples and 9.71% were lone parents. The figures for lone parent households were slightly above the national average of 9.5%, and the percentage of married couples was above the national average of 36.5%; the proportion of one person households was below the national average of 30.1%. The population density was 9.31/km2 (24.1/sq mi). Of those aged 16–74 in Wakefield, 39.14% had no academic qualifications, much higher than 28.9% in all of England. Of Wakefield's residents, 2.53% were born outside the United Kingdom, significantly lower than the national average of 9.2%. The largest minority group was recorded as Asian, at 1.41% of the population. The number of theft-from-a-vehicle offences and theft of a vehicle per 1,000 of the population was 7.9 and 3.9 compared to the English national average of 6.3 and 2.3 respectively. The number of sexual offences was 0.9, in line with the national average. The national average of violence against another person was 16.7 compared to the Wakefield average of 15. The figures for crime statistics were all recorded during the 2008–09 financial year. Wakefield had a population of 76,886 in 2001. At the 2011 Census, the population was given as 99,251. However, these two estimates are not directly comparable, as the 2001 Census did not classify the old Stanley Urban District as part of Wakefield whereas the 2011 Census classified all settlements in this area except Bottom Boat (a small village built for Newmarket Colliery workers) as parts of Wakefield. The economy of Wakefield declined in the last quarter of the 20th century as the coal mines and traditional manufacturing industries closed, contributing to high rates of unemployment. In the Index of Multiple Deprivation 2015, 14.35% of the district's lower super-output areas were in the most deprived 10% of England. Employment grew by 12% between 1998 and 2003 as the economy recovered and enjoyed growth as the economic base of the district was diversified. Growth has been supported by inward investment from European and United Kingdom government funding which has impacted on the regeneration of the area. Manufacturing remains an important employment sector although the decline is projected to continue whilst distribution and the service industries are now among the main employers. At the 2001 census, there were 33,521 people in employment who were resident within Wakefield. Of these, 20.74% worked in the wholesale and retail trade, including repair of motor vehicles; 14.42% worked within manufacturing industry; 11% worked within the health and social work sector and 6.49% were employed in the transport, storage and communication industries. Wakefield is a member of the Leeds City Region Partnership, a sub-regional economic development partnership covering an area of the historic county of Yorkshire. Regeneration projects in Wakefield included the Trinity Walk retail development to the north east of the city centre, including department stores, a supermarket and shop units. Work began in autumn 2007 but was halted in 2009, restarted in 2010 and opened in 2011. The central square at the Bull Ring has been redesigned with a water feature and the Ridings Shopping Centre refurbished. Wakefield Westgate Station goods yard and land on Westgate and Balne Lane have been developed to create retail, residential and commercial space including new offices, a multi-storey carpark serving the station, and a hotel. Developments by the river and canal, the "Wakefield Waterfront", include the refurbishment of the Grade II listed Navigation Warehouse and office, retail, restaurant and cafe units. The development includes the art gallery, The Hepworth Wakefield named in honour of local sculptor, Barbara Hepworth which opened in May 2011. The gallery has ten internal spaces, exhibiting many examples of Hepworth's work. The gallery added about £10 million to the local economy by attracting 500,000 visitors in its first year. Flats and offices were built at Chantry Waters, on an island between the river and canal. The most prominent landmark in Wakefield is Wakefield Cathedral, which at 247 feet (75 m) has the tallest spire in Yorkshire. Other landmarks in the Civic Quarter on Wood Street include the Grade II* Neoclassical Crown Court of 1810, Wakefield Town Hall designed by T.W. Collcutt and opened in 1880, and the Queen Anne Style County Hall of 1898 which are Grade I listed. St John's Church and Square, St John's North and South Parade are part of residential development dating from the Georgian period. The old Wakefield Bridge with its Chantry Chapel, Sandal Castle, and Lawe Hill in Clarence Park are ancient monuments. Another prominent structure is the 95-arch railway viaduct, constructed of 800,000,000 bricks in the 1860s on the Doncaster to Leeds railway line. At its northern end is a bridge with an 80-foot (24 m) span over Westgate and at its southern end a 163-foot (50 m) iron bridge crossing the River Calder. Wakefield has good access to the motorway system, with the intersection of the M1 and M62 motorways, junctions 42/29, lying to the north west, whilst the M1 to the west is accessed at junctions 39, 40 and 41. The A1(M) is to the east of the district. Wakefield is crossed by the A61, A638, and A642 roads and is the starting point of the A636 and A650 roads. The Council is working with West Yorkshire Metro, the other four West Yorkshire district councils and transport operators to provide an integrated transport system for the district through the implementation of the West Yorkshire Local Transport Plan. A network of local buses, coordinated by West Yorkshire Metro and departing from Wakefield bus station in the town centre, serves Wakefield and district. Buses are operated by Arriva Yorkshire, B L Travel, Poppletons, Stagecoach Yorkshire and National Express. Wakefield Kirkgate was opened by the Manchester and Leeds Railway in 1840. Wakefield Kirkgate is unstaffed and operated by Northern who operate trains to Barnsley, Meadowhall Interchange, Sheffield, Normanton, Pontefract, Knottingley, Leeds, Castleford and Nottingham. The station serves the Hallam Line, Huddersfield Line and the Pontefract Line of the MetroTrain network. Grand Central operating between London King's Cross and Bradford Interchange stop at Kirkgate. In 2009 CCTV was installed at the station, but it has acquired a reputation for being one of the country's worst stations. It is undergoing extensive renovation (2014). Wakefield Westgate opened in 1867 on the Doncaster to Leeds line. It has connections to the East Coast Main Line, trains to Leeds, Doncaster, and stations towards London King's Cross. CrossCountry trains go to Newcastle, Edinburgh, Birmingham and the South West. East Midlands Trains also run a limited service via Sheffield, Derby and Leicester to London St Pancras. Wakefield Westgate is on the Wakefield Line of the West Yorkshire Metro network. The line was electrified in 1989. Wakefield is served by inter-city express trains from both its railway stations. London can be reached in less than two hours. The nearest airport is Leeds Bradford Airport, 19 miles (31 km) to the north of the city at Yeadon. The Aire and Calder Navigation is 33 miles (53 km) from Leeds to Goole, and 7.5 miles (12.1 km) from Wakefield to Castleford, and was created by Act of Parliament in 1699. It was opened to Leeds in 1704 and to Wakefield in 1706, enabling craft carrying 100 tons to reach Wakefield from the Humber. It is still used by a small amount of commercial traffic and leisure craft. The Calder and Hebble Navigation was created by Act of Parliament in 1758 with the intention of making the Calder navigable to Sowerby Bridge. The route was originally surveyed by John Smeaton, remains open and is used by leisure craft. The Barnsley Canal, a broad canal with 20 locks, opened in 1799 connecting Barnsley to the Aire and Calder Navigation at Wakefield and was abandoned in 1953. Wakefield's oldest surviving school is Queen Elizabeth Grammar School, a boys-only school established in 1591 by Queen Elizabeth I by Royal Charter. The original building in Brook Street is now the 'Elizabethan Gallery'. QEGS moved to Northgate in 1854. The school was administered by the Governors of Wakefield Charities who opened Wakefield Girls High School WGHS on Wentworth Street in 1878. These two schools today are independent schools. National schools were opened by the Church of England including St Mary's in the 1840s and St John's in 1861. The original St Austin's Catholic School opened about 1838. A Methodist School was opened in Thornhill Street in 1846. Pinders Primary School, originally Eastmoor School is the only school opened as a result of the Education Act 1870 which remains open today. Wakefield College has its origins in the School of Art and Craft of 1868 and today is the major provider of 6th form and further education in the area, with around 3,000 full-time and 10,000 part-time students, and campuses in the city and surrounding towns. In 2007 Wakefield City Council and Wakefield College announced plans to establish a University Centre of Wakefield but a bid for funding failed in 2009. Other schools with sixth forms include: QEGS, Wakefield Girls High School, and Cathedral High School, which is now a Performing Arts College for ages 11 to 18. Wakefield's oldest church is All Saints, now Wakefield Cathedral, a 14th-century parish church built on the site of earlier Saxon and Norman churches, restored by Sir George Gilbert Scott in the 19th century, and raised to cathedral status in 1888. The first Bishop of Wakefield was William Walsham How. In 1356 the Chantry Chapel of St Mary the Virgin on Wakefield bridge was built originally in wood, and later in stone. This chapel is one of four chantry chapels built around Wakefield and the oldest and most ornate of the four surviving in England. Wakefield is also known for the Wakefield Cycle, a collection of 32 mystery plays, dating from the 14th century, which were performed as part of the summertime religious festival of Corpus Christi and revived in recent times. St John's Church was built in 1795 in the Georgian style. Three new Anglican Commissioners' churches, partly financed by the "Million Fund" were built as chapels of ease in the surrounding districts and were St Peter at Stanley in 1824, St Paul at Alverthorpe in 1825, and St James at Thornes in 1831. Holy Trinity in George Street was built in 1838-9. St Andrew's Church opened on Peterson Road in 1846 and St Mary's Church on Charles Street was consecrated in 1864. St Michael's was consecrated in 1861. The Westgate Unitarian Chapel dates from 1752. In the 19th century Wesleyan, Primitive and Independent Methodist chapels were opened and the Baptists opened a chapel in George Street in 1844. St John the Divine was built at Calder Grove in 1892. The Church of England diocese of Wakefield covered parishes mainly in West Yorkshire, parts of South Yorkshire and five parishes in North Yorkshire. It was dissolved on Easter Sunday 2014. Stephen Platten was the 12th and last Bishop of Wakefield. The Diocese of Leeds now covers Wakefield. Wakefield has two Catholic parishes - in the north St Martin de Porres incorporates the churches of St Austin's, Wentworth Terrace, opened in 1828, and English Martyrs, opened in 1932, on Dewsbury Road, Lupset, and in the south, St Peter and St Paul's off Standbridge Lane which has a modern church built in 1991. Wakefield is in the Roman Catholic Diocese of Leeds. Agbrigg Muslim Association have a Zakaria Masjid Mosque in Wakefield. The ruins of Sandal Castle and its visitor centre are open to the public. The Theatre Royal Wakefield on Westgate, designed by architect Frank Matcham opened in 1894 and currently presents a programme of entertainment including musicals, drama, live music, stand up comedy and dance. Wakefield's two central libraries closed and moved into the £31 million Wakefield One in October 2012. The new library was officially opened by singer Jarvis Cocker on 10 November 2012. Wakefield Museum moved from the former Mechanics' Institute on Wood Street to Wakefield One at the same time. The museum was officially opened by Sir David Attenborough on 9 March 2013. Balne Lane library managed a regional collection of more than 500,000 items of music and 90,000 copies of plays for Yorkshire Libraries & Information (YLI). The Yorkshire Music and Drama Library at Balne Lane closed on 31 March 2012 when the music section moved to Huddersfield and the drama section to Leeds. In May 2011 The Hepworth Wakefield gallery opened on the south bank of the River Calder near Wakefield Bridge, displaying work by local artists Barbara Hepworth and Henry Moore and other British and international artists. The gallery is thought to be the largest purpose-built gallery to open in the United Kingdom since 1968. The West Riding Registry of Deeds on Newstead Road is the headquarters of the West Yorkshire Archive Service, housing records from the former West Riding and West Yorkshire counties, and is the record office for the Wakefield Metropolitan District. Wakefield's three contiguous parks have a history dating back to 1893 when Clarence Park opened on land near Lawe Hill. The adjacent Holmefield Estate was acquired in 1919, followed by Thornes House in 1924, making a large park to the south west of the city. Clarence Park Music Festival is held annually in Clarence Park, promoting local bands. Two children's nursery rhymes with Wakefield connections are "Here We Go Round the Mulberry Bush" which may have been sung by women inmates at Wakefield prison. and "The Grand Old Duke of York" which may allude to the Battle of Wakefield in 1460, referring to Richard Plantagenet, the 3rd Duke of York. The lyrics of the popular hymn "Onward Christian Soldiers" were written at St Peter's Church in nearby Horbury. Wakefield's newspaper, the Wakefield Express, was founded in 1852. Another newspaper, the Wakefield Guardian was established in 2007, but has ceased publishing. Wakefield has a radio station, Ridings FM. In 1913 Albert Winstanley opened the Picture House cinema in Westgate. Shortly after opening it was renamed the Playhouse, and by 1972 it was part of the Classic cinema chain. It is now a nightclub. In 1935 Associated British Cinemas (ABC) opened the Regal Cinema in Kirkgate. The Art Deco building was renamed the ABC in 1962 and became a Cannon in 1986. Cineworld's first purpose-built multiplex in Britain opened in Wakefield in December 1996. The ABC closed in 1997 and has remained derelict, but there have been successive proposals to redevelop or demolish it. The National Coal Mining Museum for England (an Anchor Point of ERIH, The European Route of Industrial Heritage), the Yorkshire Sculpture Park and Nostell Priory are within the Wakefield metropolitan area, as is Walton Hall, a Georgian mansion set in what was the world's first nature reserve, created by the explorer Charles Waterton; the house is now a hotel. A small part of the 1977 BBC film The Price of Coal was filmed in Wakefield with the Mines Rescue Team based in the city. The end credits of the film give special thanks to the team. Wakefield Trinity is a Rugby League club currently playing in the Super League. The club, founded in 1873, was one of the initial founders of the Northern Union after the split from the Rugby Football Union in 1895. The club plays at Belle Vue. Several local teams play in different leagues of the British Amateur Rugby League Association, BARLA. They include Wakefield City, Westgate Wolves, Crigglestone All Blacks, Kettlethorpe and Eastmoor Dragons. Rugby Union Football is played at Sandal RUFC and was played by Wakefield RFC at College Grove from 1901 to 2004 when the club ceased to play. Wakefield briefly had a football team when Emley F.C. moved to play at Belle Vue, the ground of Wakefield Trinity Wildcats. After moving ground first to College Grove and then briefly to share with Ossett Town, Wakefield FC folded in June 2014. AFC Emley was founded to restore the club's original links with the village of Emley. Wakefield Sports Club at College Grove also has the Yorkshire Regional Hockey Academy, Wakefield Bowls Club and Wakefield Squash Club on the same site. The Wakefield Archers meet at QEGS in Wakefield or at Slazengers Sports Club, Horbury and has archers shooting Olympic re-curve bows, compound bows and longbows. Thornes Park Athletics Stadium is home to Wakefield Harriers A.C. Members Martyn Bernard and Emily Freeman competed in the Beijing Olympics. Local teams Newton Hill and Wakefield Thornes are members of the Leeds-West Riding Cricket League. There is a 100-acre (0.40 km2) watersports lake at Pugneys Country Park catering for non-powered watersports such as canoeing, sailing and windsurfing. Golf clubs include the municipal course at Lupset and the private Wakefield Golf Club at Sandal. Wakefield Prison, originally built as a house of correction in 1594, is a maximum security prison. Wakefield is policed by the West Yorkshire Police force and is within the DA, Wakefield division, which covers the whole district. Wakefield is also the location of the West Yorkshire Police Force Headquarters, located on Laburnam Road. The statutory emergency fire and rescue service is provided by the West Yorkshire Fire and Rescue Service, from Wakefield fire station. Hospital services are provided by the Mid Yorkshire Hospitals NHS Trust and community health services, including GPs, district and community nurses, dentists and pharmacists, are co-ordinated by Wakefield District Primary Care Trust.Waste management is co-ordinated by the local authority. Wakefield's Distribution Network Operator for electricity is CE Electric via Yorkshire Electricity. Yorkshire Water manages Wakefield's drinking and waste water. Novelist George Gissing was born in Wakefield in 1857; his childhood home in Thompson's Yard is maintained by The Gissing Trust. Sculptor Barbara Hepworth was born in Wakefield in 1903. David Storey born in Wakefield in 1933 was a novelist and playwright who in 1960 wrote This Sporting Life, which was made into a film in 1963 and shot largely on location in the city. Former Archbishop of York, David Hope The Rt Revd and Rt Hon The Lord Hope of Thornes KCVO PC, was born in 1940 in Thornes. ^ Wakefield's thorpes are: Alverthorpe, Chapelthorpe, Gawthorpe, Hollingthorpe, Kettlethorpe, Kirkthorpe, Milnthorpe, Ouchthorpe, Painthorpe, Snapethorpe, Woodthorpe, Wrenthorpe. Flanshaw, Kirkhamgate, Carrgate and Lupset have Old Norse origins. ^ "A very lively market town and suitably large, well served with fish and meat both from sea and by rivers... so that all food is very good and cheap there. A right honest man shall eat well for 2d a meal. There is plenty coal in the area around Wakefield." ^ The Yorkshire Archaeological Journal, 1886. Google Books. 30 July 2007. Retrieved 5 August 2011. ^ Dodsworth's Yorkshire notes, the wapentake of Agbrigg, Roger Dodsworth, 1884. Google Books. 20 April 2007. Retrieved 5 August 2011. ^ Adeney, Martin; Lloyd, John (1988). The Miners' Strike 1984-5: Loss Without Limit. London: Routledge & Kegan Paul. p. 26. ISBN 0-7102-1371-9. ^ "Election 2010 – Hemsworth". BBC News. Retrieved 9 May 2010. ^ "Double celebrations for the Hepworth Wakefield as it celebrates its first birthday and welcomes its 500,000 visitor" (Press release). Wakefield Council. Retrieved 10 November 2012. ^ "Wakefield Council - Wakefield Cathedral". Retrieved 4 September 2010. ^ "Wakefield College Information". Wakefield.ac.uk. Retrieved 5 August 2011. ^ Leeds Times Saturday 27 May 1893: "Chat in the porch"
^ Leeds Mercury 24 May 1893: "The Mackie memorial church, Calder Grove"
^ "Playhouse (Wakefield)". The Theatres Trust. Retrieved 22 December 2013. ^ "Former ABC cinema on Kirkgate will make way for new homes and shops". Wakefield Express. Johnston Press. 7 December 2013. Retrieved 22 December 2013. ^ "Wakefield's twin towns". Wakefield City Council. Archived from the original on 17 October 2013. Retrieved 14 July 2013. ^ a b "British towns twinned with French towns [via WaybackMachine.com]". Archant Community Media Ltd. Archived from the original on 5 July 2013. Retrieved 12 July 2013. 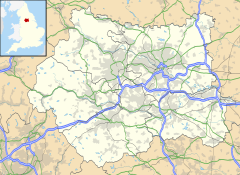 Wikimedia Commons has media related to Wakefield, West Yorkshire (city). Wikivoyage has a travel guide for Wakefield (England).